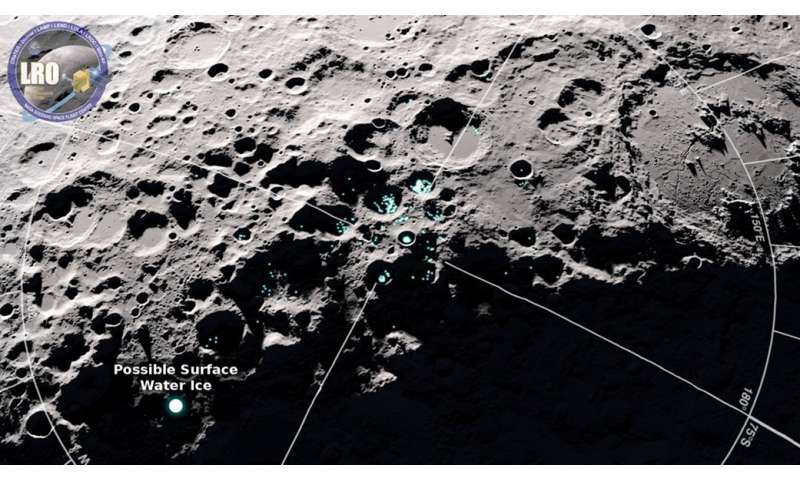 "We found that the coldest places near the moon's south pole are also the brightest places—brighter than we would expect from soil alone—and that might indicate the presence of surface frost," said Elizabeth Fisher, the lead author of the study, published in Icarus. Fisher carried out the data analysis while doing research at the University of Hawai'i at Manoa after earning her undergraduate degree. She is now a graduate student at Brown University. The frost was found in cold traps close to the moon's south pole. Cold traps are permanently dark areas—located either on the floor of a deep crater or along a section of crater wall that doesn't receive direct sunlight—where temperatures remain below minus 260 degrees Fahrenheit (minus 163 degrees Celsius). Under these conditions, water ice can persist for millions or billions of years.